Fighting fires has always been a dangerous and noble venture, even with the proliferation of aerial firefighting. But things are looking to get a lot safer for firefighters with the help of the Boeing and mixed reality. Boeing, now with 100 years of experience under its belt and a massive list of subsidiaries, continues to innovate in the aircraft industry. This latest example is the work from their Insitu division, a manufacturer of unmanned aerial vehicles (UAVs) whom they acquired back in 2008. Insitu has a system designed for managing UAVs called INEXA Control. This system is much like a 2D top-down view, with all the obvious limitations. However, they have been using the Microsoft HoloLens to convert INEXA Control's 2D maps into an accurate 3D map of hazardous areas like the location of wildfires. This 3D overview map tracks all the manned and unmanned vehicles, as well as the fire teams with boots on the ground. In the low-visibility setting of wildfires, the ability to clearly see their situation allows these virtual pilots to avoid accidents in what is already an extremely dangerous setting. 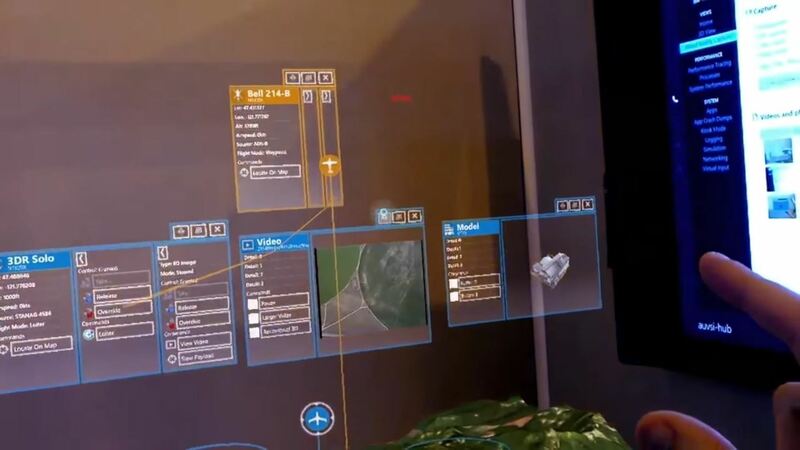 INEXA Control with the HoloLens today is like a real-time strategy game. With full visibility of the location, a fire chief has the ability to make the decisions that help solve a problem, while keeping the humans on site safe. Having fast and full access to the details of the scene allows for quick changes and smarter management of resources. Plus, multiple HoloLens users can check out the map at the same time and coordinate with one another. Drones and augmented reality devices seem to be a popular and growing combination. Epson Moverio, a division of well-known printer company Epson, has for some time been working on their own a version of this type of drone-control device. The BT-300 Smart Glasses is Epson Moverio's third generation head-mounted AR display. In an interview earlier last year with Armdevices.net, Valerie Riffaud-Cangelosi, the New Market Development Manager for Epson Europe, was very clear of the winner in her mind. When asked about the primary market for this device, she said, "The market of opportunity is quite big, there are a lot of different areas and sectors that will use the product. Probably, one of the main will be the drone market... because piloting a drone with the glasses is a perfect fit." In September 2016, Epson Moverio announced their partnership with popular drone manufacturer DJI, who is known for high-end drones on both consumer and professional levels. The partnership will be to design augmented reality solutions for piloting drones. When you see multiple, yet completely different types of technology companies moving down similar paths, you have to assume they are onto something. I have no doubt that in the near future, anytime you see a drone flying by, you can find someone nearby wearing smart glasses. And maybe one day, the guys wearing those glasses will be our firefighting teams, keeping us safe—in a safe way.